It was December 2009, and the official announcement had just gone out about my taking the helm of a magazine founded in 1845. I suppose I should have expected the reporter's question. But instead I was surprised. Irritable thoughts swirled unbidden: “Why is being a woman in leadership still considered an amazing thing? I mean, how was the magazine different when I was its first female executive editor for eight years?” I just wanted to be thought of as capable, I realized, not capable for a woman. Other reporters followed similar themes. The questions stayed with me on the commute home. Did people think I would tint all the pages pink? Start running fashion on the Web site? Create a recipes app? Well, of course. The children saw plainly what I had not. And until that moment, I had been thinking about things in exactly the wrong way, too: it was time to appreciate the opportunity that I had to help. 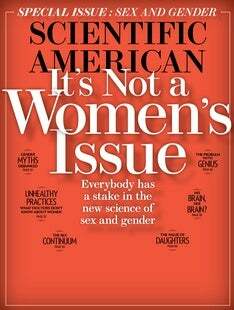 At Scientific American, we haven't been perfect about that, I have to admit, but we're trying to get better. The staff is about half women, for instance. About half of our large (more than eight million a month total) online audience is women. When we looked (after a story count showed a skewed authorship ratio in print features), we found that we have about a 50–50 male-female overall average for writers over the course of a year. We know we need to do more, and we welcome your ideas.